The title of this piece comes from a recent Josh Brown article titled, Delusions and Entitlement (he deserves full credit for this quip). At the end of his article, Josh then links to my recent post, Fake News? (thanks again, Josh). Fake News? talks about a Private Equity (PE) return metric (Internal Rate of Return or IRR) that is commonly pitched and used to promote PE outperformance as compared to public markets. I wasn’t planning on posting something again so quickly about how some PE pitches present returns in a manner that might be misleading (click here for more on why I’m using this strong word – it includes links to a solid McKinsey paper that includes arguably stronger words such as “dangerous”). But, then I received something that made me realize how much I appreciated Josh’s blunt words. The illustration could easily be used to make a make a compelling case for PE. The sources are impressive and it was even quoted in a leading publication with a similar headline. I referenced this quote earlier and used it in my Fake News post (click here to read more). It is a direct cut and paste of fine print that I found at the very back of a 50 page plus pitch book that was also touting PE outperformance as compared to public markets. This firm didn’t provide this disclosure. 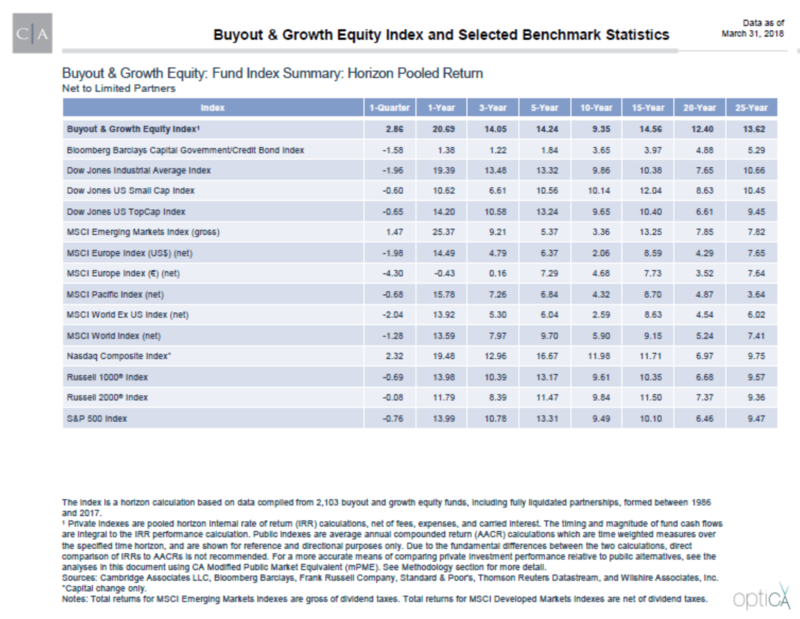 What are the PE Buyout & Growth Equity Index returns that the firm used in the comparison to public markets, even though the index provider states that it isn’t recommended? IRRs, which at least one top academic from Oxford University has labeled #IRRelevant (for more on this pick up a copy of this book, Private Equity Laid Bare and note Chapter 11). As a reminder, the big problem with IRR is that it assumes that investments will achieve the same returns as earlier investments. Realized cash distributions are assumed to keep earning the same returns in the future for the complete life of the fund or private investment. Translation: even though we all know it can be misleading and is forbidden by regulators when talking about public market returns, IRR assumes that past performance will equal future performance. These are indeed not returns that any investor has received. On other pages of the Market Insight deck, the firm also compares the volatility of PE to public markets in a manner that makes PE look less volatile. They state that PE volatility has been 10% vs. 15-20% for public markets. Maybe this should be called low volatility that no PE investment has experienced. PE volatility is a complicated story, but as a concise summary, a quote from my friend Wes Gray seems appropriate (click here for more). Wes goes on to quote a line from Pioneering Portfolio Management, the book from David Swensen, the Chief Investment Officer of Yale, that arguably made PE investing so popular. I’m not suggesting with any of this that some PE deals are not attractive. Some are. As in my last piece, I’m also not listing the names of the firm I’ve referenced. The point is not to call out any specific firm, as these practices are widespread.